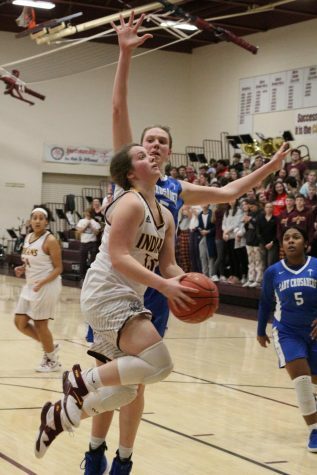 Junior Brooke Denning attempts a basket at a previous game against Colby. 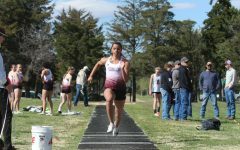 The Lady Indians recently won the Colby Invitational which makes their record 8-3 for the season. 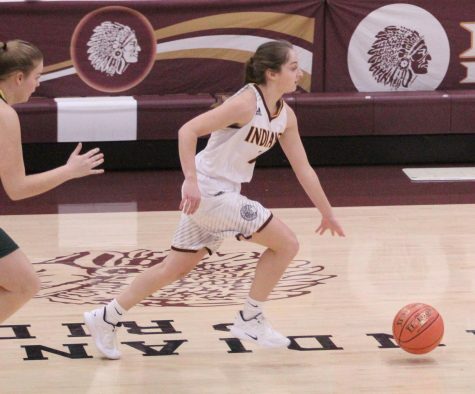 The Lady Indians basketball team traveled down to Colby on Thursday, Friday and Saturday where they went 3-0 at the Colby Tournament securing them a first place victory. 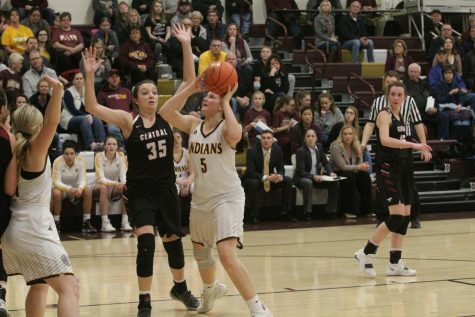 Senior Jaycee Dale led the scoring for the Indian 59-36 win over the Goodland Cowboys with 19 points while senior Savannah Schneider followed close behind with 16 points. 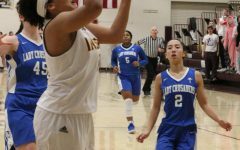 Other scores included junior Tasiah Nunnery with nine points. Senior Kallie Leiker and juniors Isabel Robben and Brooke Denning all threw in four points, and freshman Taleia McCrae rounding out the scoring with three points. 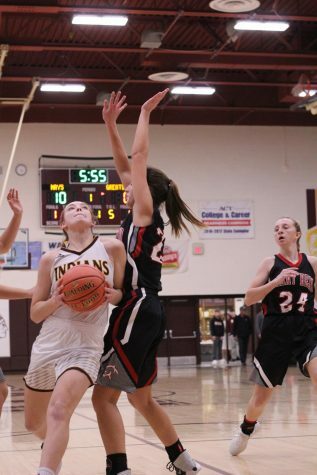 The Indians took and early victory going 14-5 in the first quarter and 13-4 in the second. After half time, the Cowboys would try to make a comeback going 14-12, but their efforts would not be enough as the Indians outscored them by seven in the fourth quarter. 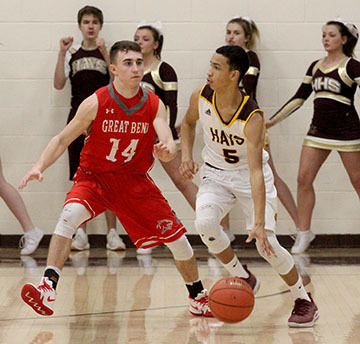 Hays took a three-point lead over Scott City in the first quarter, and the Beavers would not be able to catch up the rest of the game. 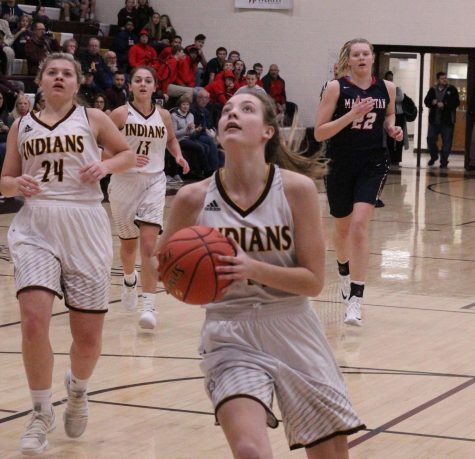 After going 16-13 in the first quarter, the Indians walked off the court with an 18-point lead at halftime with the score being 40-22. 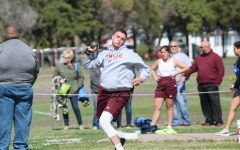 They would continue their lead going 16-14 in the third quarter. 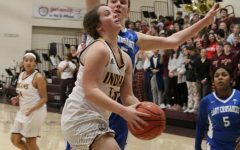 The Beavers would try to come back in the fourth quarter going 14-12, but their efforts would not be enough as the Indians took the 68-50 victory. Senior Savannah Schneider led the scoring totals with 25 points. 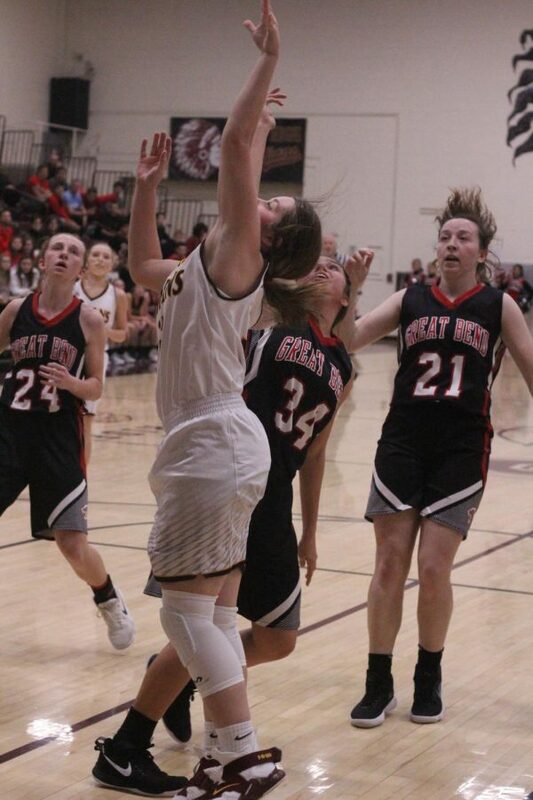 Seniors Jaycee Dale and Mattie Hutchinson each threw in 10 points. 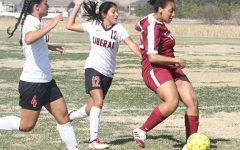 Juniors Tasiah Nunnery and Brooke Denning threw in eight and seven points respectively. 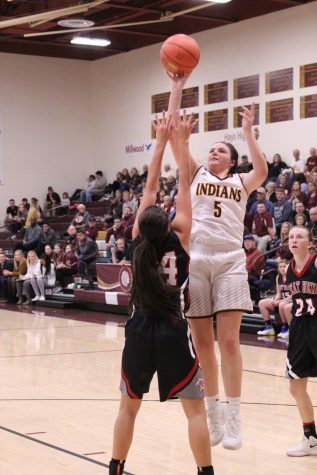 Rounding out the scoring was sophomore Brooklyn Schaffer with five points and junior Isabel Robben with three points. For the championship, the Indians would take an easy 50-19 victory over the Colby Eagles. In the first quarter, the Eagles only scored two points while the Indians scored nine. 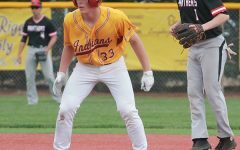 The Indians would continue their lead with the score being 24-4. 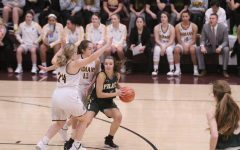 The Eagles would try to make a comeback scoring 10 points to the Indians’ 11, but it would not be enough as the game would end with the Indians taking a 31-point lead. 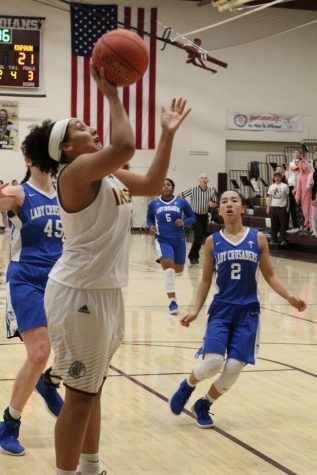 Senior Jaycee Dale led the scoring with 12 points while junior Tasiah Nunnery followed close behind with 11. 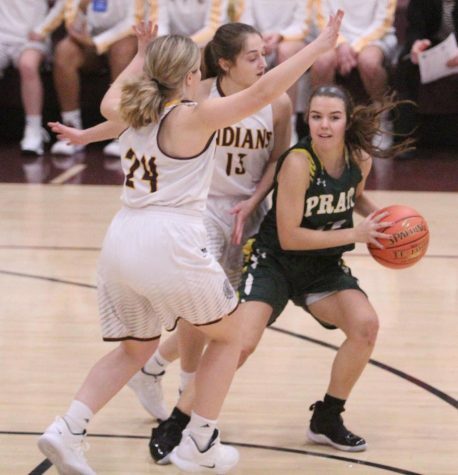 Also adding to the scoring totals were senior Savannah Schneider and junior Brooke Denning, both with seven points while junior Isabel Robben threw in six. 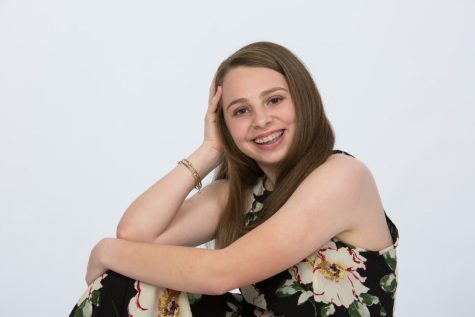 Rounding out the scoring was senior Mattie Hutchinson with three points and sophomore Brooklyn Schaffer and freshman Taleia McCrae, each with two. 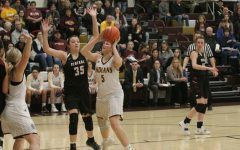 The Indians improved their record to 8-3 and will play the Salina Central Mustangs on Jan. 25 at home.